Critical failures can hit you at any point in your life, and finding stress management techniques to keep them from crushing you can feel impossible. What happens when your career is floundering? Or when you lose a bunch of money and don't know how to pay the bills? Or when a relationship goes sour? In "Mini Habits for Resilience", author Tom Meitner explores the mini habits that help you understand why you're failing and can reverse the course for you. 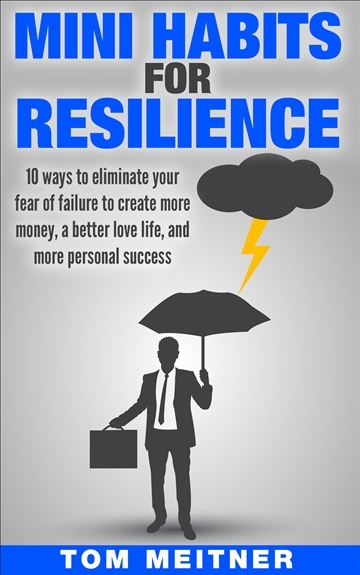 By building resilience in your life, you can bounce back faster and enjoy personal success in any area of your life. With personal stories of his own life, coupled with tales of famous "failures" who turned into successes,Tom Meitner shows you free habits that help you build a life that responds positively to failures.This approach allows you to be fearless in your efforts, knowing that the worst case scenario will not bring you down. Very few free personal development Kindle books can offer this level of insight into what prepares you for failure. Tom Meitner is a father and husband who lives in Wisconsin. Since being evicted and living below the poverty line after graduating college, he has been able to build a successful copywriting business. His secret? Going "off script" and figuring out a way to live his life that works. Instead of following the path everyone else had in front of them, he took small steps towards building the life that he wanted. Instead of sitting back and bragging about how awesome his life is, he wants to help other people do the same. As he writes on his website and in his books, he's not special or smarter or more "connected". He's a regular dude that just took steps that most people are ignoring. Go off script. Figure out what works for you. And you can fix all the things that aren't working in your life.